The US Open and sound — or noise, depending on your frame of reference — are once again intertwined. 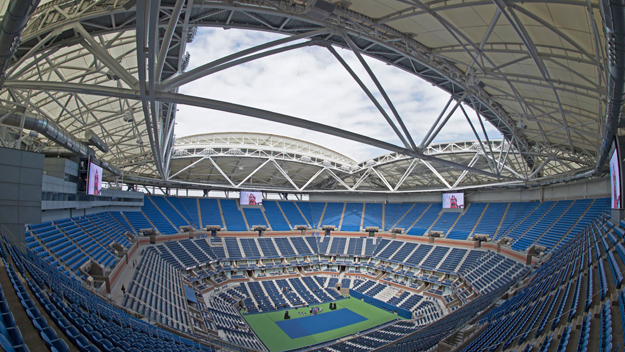 The two-week event at the USTA Billie Jean King National Tennis Center has long featured a range of sonic incidents, from chattering spectators, whose sound is amplified by the retractable metal roof installed at Arthur Ashe Stadium last year and has already drawn comment from ESPN’s announce team this year, to malfunctions of the audio systems, such as the faulty audio processor that disrupted Andy Murray’s play last year. But, to the network’s audio team, led by Audio Supervisors Leonard Fisher and Florian Brown, any noise is just part of the soundscape. “Anytime I hear an announcer talk about sound on the air, I’m happy,” says Brown. The ESPN team is rounded out by effects mixers Tim Bishof and Tim Dunn. They’re working closely with equipment supplier Gearhouse and its staff: main engineer Nick Bowey and technicians Ken Fryer and Andy Williams. They’re all focused on an audio engine that has grown year to year, giving the US Open some of the most comprehensive audio coverage in sports. A pair of Lawo mc256 digital mix cores provide a staggering 8,000 I/O points, virtually all of which are being used, says Brown, by a wide range of sources: from the additional microphones around the umpires’ chairs — “snoop and argue” Sennheiser MKH 416 short shotguns aimed at players’ seats to pick up discourse between players and officials — to sound from press feeds, the PA system, and other broadcast feeds. The Tennis Center is miked as thoroughly as a reality-show set and shares a similar philosophy: don’t miss anything, no matter how many moving parts there are to the narrative. This year’s US Open is the first in the wake of substantial RF reallocation. RF is being managed through Wisycom RF distribution and reportage systems, supplied by Gearhouse. In addition, ESPN is using the new 24-channel GTX Series 6.5-GHz Ultra-Wideband wireless microphone system from Alteros, an Audio-Technica company, at Practice Court 1 and for on-set interviews. The practice-court system is a single GTX3224 main unit for control of all four locations. For interviews, players are being wired with a GTX24 beltpack while riding in the elevator leading to the announce set, enabling the interviews to start before the player is even seated at the desk. “It’s running like [a late-night talk show], where you’ll hear interaction between the host and the guest before they even get on the stage,” explains Brown. “The Alteros system is fantastic. We extended the antennas, and it was up and running in two minutes. The learning curve is next to nothing, and the system itself is plenty robust. We’re trying to move ourselves up higher [in frequency] this year, since the RF situation has changed.” The system does not require frequency coordination. Another new wrinkle is deployment of a Waves SoundGrid system. This software/hardware combination provides automated processing, including upmixing and noise reduction for several of the smaller courts, increasing overall productivity. “We’re able to specifically tailor the processing needs for each court location,” Brown notes. The US Open is also a polyglot of networking formats. In addition to SoundGrid, which is itself a networked audio-over-Ethernet proposition, Dante has been deployed for much of the transport (what hasn’t continued using MADI), and RAVENNA is used for the commentary signals.